Challenge Kickoff Tomorrow (3.29) Rain or Shine! – Start R.I.G.H.T. Challenge Kickoff Tomorrow (3.29) Rain or Shine! The Start R.I.G.H.T. Challenge begins tomorrow. The event will be held rain or shine! The Start R.I.G.H.T. Challenge begins tomorrow with a celebration at Hunt Park in Riverside from 9 am to 12 pm. 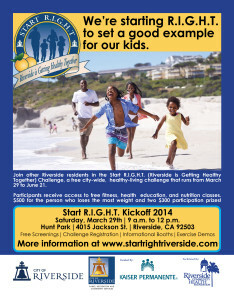 Bring the family for a day of family fun and fitness. Also, remember you must have an official weigh-in (adults) and check-in (children) to be eligible for the grand prizes! You can weigh-in at this weekend’s event! Remember you can always call us with questions at 951.788.3471!